Mathematics is really about solving problems, not just about moving letters and numbers around. Most real-world problems are stated using words and we need to translate them into mathematical statements. You can decide which method you understand best, but if you can follow the simultaneous equations method, it is probably best for future problems. 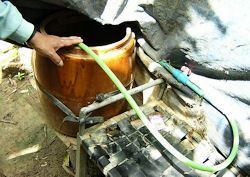 Water is being drained out of a tank through 2 pipes at the rate of 330L/min. We know that one pipe releases 50L/min more than the other. How much do the 2 pipes drain each? Rough estimate: The amount coming out of the 2 pipes is about 300 L/min so if each pipe has the same width, then the rate will be about 150 L/min for each pipe. But one pipe's rate is 50 L/min more than the other, so we expect the answers to be around 125 L/min and 175 L/min. Solution: Let x be the rate of the slower pipe (in L/min). So the drainage rates of the 2 pipes are `140` L/min and `190` L/min. Let A be the rate of the faster pipe and B be the rate of the slower pipe. We have A − B = 50 and A + B = 330. So `A = 190`. Since `B` is `50` L/min slower, then `B = 140`. So the drainage rate of the faster pipe is `190` L/min and the rate of the slower pipe is `140` L/min. 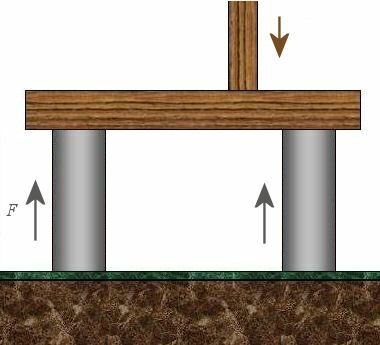 A beam is supported by 2 pillars. The downwards force (due to gravity) is equal to the sum of the 2 upwards forces (due to the 2 pillars). Such a system is said to be in equilibrium. The downward force is off-center in this example, so it is not acting in the center of the beam.The downwards force is four times the first upward force, and the second of the two upward forces is `6.4\ "N"` more than the first. Equilibrium: Forces are in "equilibrium" if they cancel each other out and there is no movement in the system. 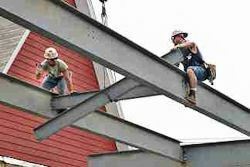 Beam: A beam is normally made of timber, steel or concrete and holds up a roof (or similar). Here is our system. Note the off-center weight acting on the beam. We expect the three forces to each be less than 10 N, based on some quick trial and error. If the first upwards force is 2 N, the second will be about 8 N (that's 6 N more) and 2 + 8 = 10. Our downward force is 5 times the first, somewhere near the 4 times that what we need, so it's a pretty good guess. Let the first upward force be F, as shown in the diagram. The second upward force is `F+6.4`. So the 3 forces are: `3.2` N, `9.6` N and `12.8` N.
This is close to our earlier estimate and all statements in the question are true with these forces. Let the 3 forces be F and G (upwards) and H (downwards). This gives `G = 9.6` and `H = 12.8`. So the three forces are `3.2` N, `9.6` N and `12.8` N, respectively. "How can the the third force and first force be three times the first force? I just don't get it. How can the first force be three times it self when it is equal to its self? It just confused me." If the second of the two forces is 6.4 N more than the first and the third is four times the first, what are the forces? To illustrate what this means, let me just take a guess value for the first force. Force 3: 40 N (this is because the third force has to be four times the first). "The second of the two forces is 6.4 N more than the first. The third force is four times the first. What are the forces?" A vial contains 2 g of a drug which is required for two dosages. One of the patients is a small child and the other is a large adult who needs to get 660 mg more of the drug than the child. How much should be administered to each? 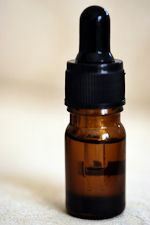 (Vocabulary: A vial is a container for storing liquid). We need to use consistent units throughout. The 2 g of drug is equivalent ot 2000 mg. Rough estimate: We expect the dosages to be around 700 mg and 1300 mg, based on similar thinking to Example 1 above. Let the amount the adult gets be d mg. The child will get d − 660. So the adult gets 1330 mg and the child gets 670 mg.
Let the first amount be x and the second y. Adding gives `2x = 2660` so `x = 1330`, then `y = 670`. So the amounts of dosage should be `1330` mg for the adult and `670` mg for the child. 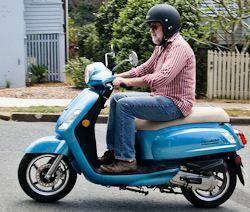 The manufacturer of a scooter engine recommends a gasoline-oil fuel mixture ratio of 15 to 1. In a particular garage, we can buy pure gasoline and a gasoline-oil mixture, which is 75% gasoline. How much gasoline and how much of the gasoline-oil mix do we need to make 8.0 L of fuel for the scooter engine? 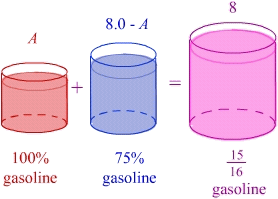 In this question, we must consider the percentage of gasoline in each mixture. Let A be the amount of 100% gasoline required. So the amount of the 75% gasoline-oil mixture will be `8.0 − A`. Therefore, we need to add `6` L of pure gasoline and `2` L of the 75% gasoline-oil mix to make the correct fuel for the scooter engine. We will let the amount of 100% gasoline be G, the amount of 75% mix be M and the final amount is 8.0 L.
The final mixture is in the ratio 15:1 which means 15/16 is gasoline. So the amount of pure gasoline required is `6` L.